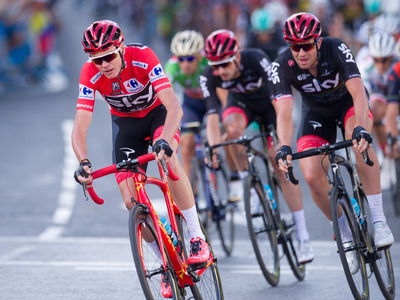 Getty ImagesChris Froome, pictured here leading the way at Vuelta, could face a race suspension. Renowned British cyclist Chris Froome has failed a drugs test. The four-time Tour de France winner’s urine sample during the Vuelta a España in September contained twice the permitted level of salbutamol, a legal asthma drug. Froome will challenge the result, but if it is upheld he could face a lengthy ban from the sport. Four-time Tour de France winner Chris Froome has failed a drugs test, according to The Guardian. Froome submitted a urine sample that contained twice the permitted level of salbutamol, a legal asthma drug, during his 2017 victory at Vuelta a España in September. He maintains innocence and, according to The Guardian, said that “it is well known” that he suffers from asthma, that he knows “exactly what the rules are,” and that he used an inhaler to manage his symptoms. Cyclists are allowed a level of 1,000 nanograms of salbutamol per milliltre in their urine, as per World Anti-Doping Agency rules. Froome’s sample was double that. Froome is considered to be one of the most successful Tour de France cyclists of all time, thanks to four championship wins. He also won the 2017 Vuerta title, is a two-time Olympic bronze medalist, and received an OBE in 2016. He said that the world governing body for cycling, the Union Cycliste Internationale (UCI), is correct to examine the test results and said he would cooperate with it’s investigation. “I will provide whatever information it requires,” he said. It is understood that Froome and Team Sky will challenge the result of the test. However, if the result is upheld, Froome will lose his 2017 Vuelte title, be handed a significant ban from the sport, and could therefore be suspended for the Giro d’Italia and the Tour de France in 2018.